The Kings Park Psychiatric Center on a cold Winter's day. 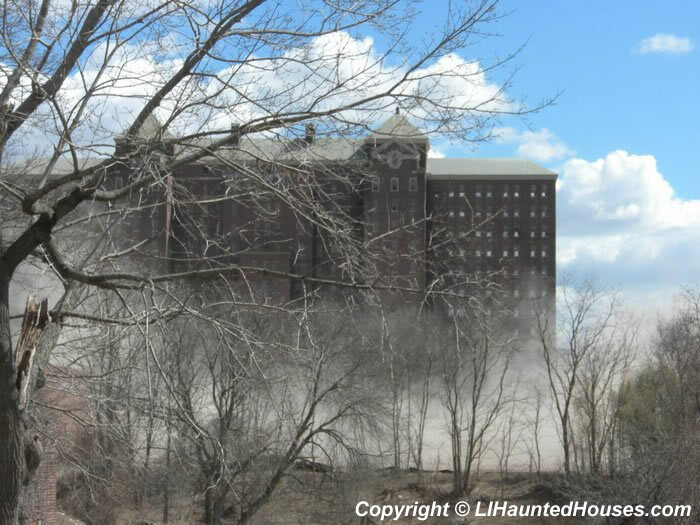 Ghosts, spirits, and apparitions are things you read about in ghost stories or watch in horror film, but to many people on Long Island, these forays into the paranormal are real. The rich cultural history of the area has lent itself to an even richer history of haunted houses, haunted lakes, and ghosts galore. Whether you are looking for a good fright, hunting for spirits from the beyond, or are a local history buff looking to poke around bits of authentic Long Island history, there is a site (and sight) for you! Amateur and professional paranormal investigators have delighted in the strange sights and spooky sounds of Long Island’s historical homes. If you are looking for help with otherworldly activity, a group known as the Long Island Paranormal Investigators have been in service for the past 12 years, and they make it their mission to investigate urban legends and conduct private investigations to help people cope with paranormal activity in their homes and other locations. Many Long Islanders are familiar with such classic real haunts as the Kings Park Psychiatric Center, Lake Ronkonkoma, and the Amityville Horror House, but have you heard of the legend of the Hanging Tree in Patchogue or the ghost that haunts Morgan Hall in Glen Cove? Whether you believe the stories or not, each of these locations have interesting histories behind them that are bound to intrigue generations to come. For many years, Long Islanders have broken into this historic location to see the eerie condemned facilities. The Psych Center housed over 9,000 patients at its height, who were subjected to overcrowding and deplorable conditions, as well as dramatic procedures such as lobotomies and electro-shock therapy. From inside and outside the many buildings, people have reported yells and screams of deceased patients, and some say they can see ghosts in the windows. Although you cannot go into the buildings, you can drive through the grounds for a quick peek. The grounds are monitored by the police. According to legend, a Native American woman fell in love with a European colonist and was unable to be with him, either because her father, the Chief forbid it, he was killed by colonists, or he was killed by natives. As a result, the woman was distraught and drowned herself in the lake. Since then, it is said that at least one person drowns in the lake each year, and the victims are typically male. It is also said that in the winter, ghosts of people in older-styled clothing can be seen ice skating on the lake. 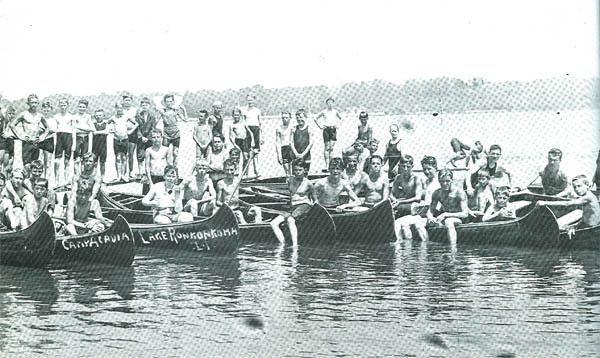 For more about the stories surrounding this eerie lake, check out our Legends of Lake Ronkonkoma page. According to the history of the Amityville Horror House, the Lutz family moved into the house and left 28 days later due to paranormal activity. The previous owner of this house was to have killed 6 members of his family in that house. A book was written about this house that has led to a lot for controversy around the paranormal activity. Various movies have been made as well. The house’s address has been changed from the well know 112 Ocean Ave, as well as renovated. Inside tours of the home are not available because it is a private residence. It is said that the bleachers of Centereach High School are haunted by James Halversen who used to run at the track every day. On January 3rd, 1997 at 8:00 PM, Halverson and his dog were shot. Some people can feel his presence or even a man running on the 5th lane of the track. Some say they also have seen a glowing object in the northeast corner of the track. What can be so scary about a movie theater? Unless, of course, you are going to see a scary movie. Well, some people say they have seen figures and shadows going across the movie screen. Even some employees report lockers being open and doors mysteriously opening. Although the theater is now gone, many still believe that ghosts still haunt that area. This house has a pre-revolutionary story behind it. It is said to be haunted by Annette Williamson, the daughter of a former owner. She had allowed British soldiers to stay in the home and was believed to be a spy. She was hung on the second story rafters and her spirit haunts the kitchen and stairways. Visitors say they can hear her cries and light bulbs flicker. The restaurant also has a “Ghost Bar” where you can view pictures of Annette Williamson. Although mostly demolished hospital, it is believed that the spirits of staff and patients still roam the woods where the hospital used to be. Some have even reported screams being heard and misty figures in the woods. This landmark is said to be haunted by a caretaker who hanged himself in the original lighthouse after his daughter grew ill and died before doctors could reach her. People say they have seen his figure wandering around the lighthouse, they have seen windows open and close on their own, and the doors, although heavy, have reportedly been spotted opening and closing on their own. Cemeteries always seem to be a place where many believe paranormal activity takes place, but this one is specially haunted by the Montaukette Indians who lived in the area. There is a large rock on the grounds that was once considered the Council Rock. Some say you can hear the drums of the Montaukettes and their chief whose spirits are still in that cemetery. Just outside the cemetery is where Teddy Roosevelt’s rough riders died of disease, and many claim that their spirits haunt the grounds as well. In October of 1741 in the midst of the Revolutionary War, the Battle of Fort Slongo broke out as the American soldiers attempted to take the fort from the British. It only took a matter of minutes before the American soldiers claimed Fort Slongo, now called Fort Salonga. Many claim to hear gunshots and other battle noises taking place early in the morning. Interested in meeting a ghost while getting a slice of pizza with a ghost? No? Well, don’t go to the bathroom at this Pizza Hut where it is said that someone died there. Some say they can hear whispers and employees claim pots and pans fall off the shelves on their own. Although no town records show it, there are many legends behind the haunted overpass on Sweet Hollow Road. One legend is that a school bus full of children was traveling on the Northern State overpass bridge above Sweet Hollow Road on a snowy day, and the driver lost control and skidded off the bridge, killing everyone on the bus. According to the story, if you park your car under the bridge and put it in neutral, the ghosts of the children will push your car forward. Another story says that three boys committed suicide by hanging themselves off the Northern State Parkway overpass bridge and on some nights you can see shadows. There is also a version of the Mary’s Grave story surrounding the sight, in which a woman named Mary was having a fight with her boyfriend in the car and was either pushed out or jumped out, and was hit by oncoming traffic. People claim to see the ghost of a woman in a white dress haunting the road, and they say she will jump in front of you when you pass. A further story around this road is that a police officer was shot when he pulled over a driver. It is said that if you are driving on the road, you might get pulled over by a cop who will just let you go, but as he walks away you will see the back of his head blown out from the shotgun that killed him. With homes ranging in ages from pre-Civil War, Old Bethpage Village Restoration will not only teach you about early Long Island living, but you might see a ghost if you look carefully. People have seen a woman walking around the second floor of the Conklin House in period dress who is not an actor working for the Village Restoration. Katie’s is a popular bar in Smithtown and home to a ghost named Charlie, who is said to have been a bartender and bootlegger during the 1920s. After committing suicide, he is said to frequently visit the bar and many patrons have felt or seen him. Other guests in 19th century dress have appeared in the bar, and the figure of a woman has been seen walking up and down the bar and down the basement stairs. Women have reported toilet seats jumping open and making banging sounds when no one else is in the bathroom, and footsteps have also been heard coming from the basement when it is unoccupied. Glasses have also been known to fly off the bar and tables. This former estate of J.P. Morgan is said to be haunted by his daughter, Alice, who died to typhoid fever in the mansion. Many claim to have seen her walking the corridors or the attic in a long black dress. It has been reported by many that a ghost haunts the ferries as they travel the sound. Many riders have seen the ghost of a former captain who wears a weathered uniform. On this secretive military base, it is believed that the government conducted secret experiments referred to as “The Montauk Project,” which included studies on UFOs and the testing of time travel. It is said two boys were kidnapped and experimented on, and that one was successful in opening a door to the fourth dimension, and who let out a creature from this dimension that still resides in underground containment below the camp. The Hanging Tree is located in Patchogue off Grove Avenue near the Swan River. Stories say that this spot was used back in colonial times as a place to hang accused witches, but others say that others have used the tree to hang themselves. Visitors have seen moving shadows and strange lights, and have felt very hot or cold spots near the tree. Paranormal investigators have been pushed and had equipment knocked from their hands. Investigators also say that EVPs (electronic voice phenomenon) have been found here. There have also been reports of a ghostly woman in a white dress. Before this twenty room house was an accredited museum, it was used in the American Revolution by the Townsend family. During the Revolution it was used to quarter British soldiers, including Major John Andre, who attempted to bribe Benedict Arnold to surrender his troops only to have the plot foiled by Townsend’s daughter, who overheard his discussion and had it reported to General George Washington. The ghost of Andre has been seen wandering the house, along with the ghost of a woman who was quartered by an officer who was her lover. Many museum employees and visitors claim to smell apple pie and cinnamon wafting through the house, which is considered to be a welcome from the lady in the kitchen. This ice cream factory closed down in the 1920s and was later demolished in 2003. There are two central stories regarding this location. In the more than 80 years that it was abandoned, it is said that a young boy was playing on the property and was climbing on machinery when he fell to his death. It is said you can hear a young boy running around, and doors would regularly open, close, and lock themselves. Another legend is that a young woman went to the factory with her suitor in the 50s, as it was then a hideaway for couples seeking intimacy. It is told that either the woman refused the suitor’s advances and was killed, or the two were followed by a man who then murdered both of them. People have reported hearing sounds of a woman screaming and crying. In 1854 the Wickham farmhouse in Cutchogue was the site of a gruesome axe murder where Mr. and Mrs. Wickham were killed in their own home by a former farmhand. The farmhand was caught days later and hung in Riverhead in front of an angry mob of onlookers. In 1988, the later owners, Anne and John Wickham, awoke to a dark figure standing over their bed in the middle of the night. After that incident the bedroom was sealed and hasn’t been opened since. Some say you can hear the footsteps of the farmhand coming from the second floor. This 126-room, 109,000 square foot mansion in Huntington was built in the 1900s by wealthy banker Otto Herman Kahn. Supposedly the mansion has secret tunnels, passageways, and rooms, as well as an area in the basement with bars resembling a cage. People have claimed to see shadowy figures lurking around the property and when people have gone to take a photo of Otto Kahn’s portrait, their cameras have gone off without them touching the button. Watery footprints have also appeared in the pool room late at night after the pool has closed. and think it should be added to this list, email us!